Radiator Repair - Orinda Motors Inc. 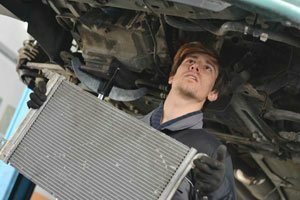 The radiator repair Orinda Motors provides is, bar none, the best in the area. At Orinda Motors, we see many vehicles for radiator repair, brake repair, coolant service, oil change and other auto repair services. There are many commuters driving on Highway 24 through Orinda, traveling between Walnut Creek to Oakland and San Francisco. This long commute and stop-and-go traffic makes for wear and tear on any vehicle. The chances for a vehicle to overheat and require radiator repair at Orinda Motors increases for these commuters. Radiators regulate the internal temperatures of your engine. When a radiator overheats, it could cause engine problems which can become very costly to your budget. The best way we approach radiator repair at Orinda Motors is by proactively providing coolant service to your vehicle. Old coolant needs to be flushed out on a periodic basis because it can eventually become acidic, eating away the metals in your radiator and engine. With regular auto service from our ASE-Certified auto mechanics, you can avoid costly radiator repair by requesting coolant service. “Helpful and friendly service all the way through the process from initial inspection to bid through completion.” -- Steve S.
To keep your radiator in great repair, contact Orinda Motors for an appointment. If you have questions about auto repair or maintenance services for your vehicle, call us. Our team of auto mechanics looks forward to serving you the next time you pass through Orinda!